So. It's October. How the heck did that happen? I mean, I feel like I say this every month, but I have no idea where September went. I'm sure it has something to do with the fact that I was out of the country for 8-ish days. But sheesh...8 days out of 30 doesn't seem like that many. But it totally was. I'm still playing catch-up, and probably will be for the next couple of weeks or so. I think what I'm taking the long way around is apologizing for not having this post up first thing this morning. I did, however, get by to visit all of the beautifully baked links from September and as usual, they lit a fire under my arse to get into the kitchen, turn on the oven, and start kneading some dough - thank you! 1. Susan from The Spice Garden baked a batch of Cider Doughnut Muffins inspired by this post. 2. Joyce from Kitchen Flavours baked a savory loaf of Jalapeño Cheddar Cornbread inspired by this post. 3. Karen from Karen's Kitchen Stories made some flaky Chocolate Croissants inspired by this post. 4. Connie from My Discovery of Bread made some tempting Seeded Brioche Hamburger Buns inspired by this post. 5. Heather from girlichef (that's me) made what became a fast favorite in our house, these Ham, Cheese, & Broccoli Pretzel Pockets inspired by this post. 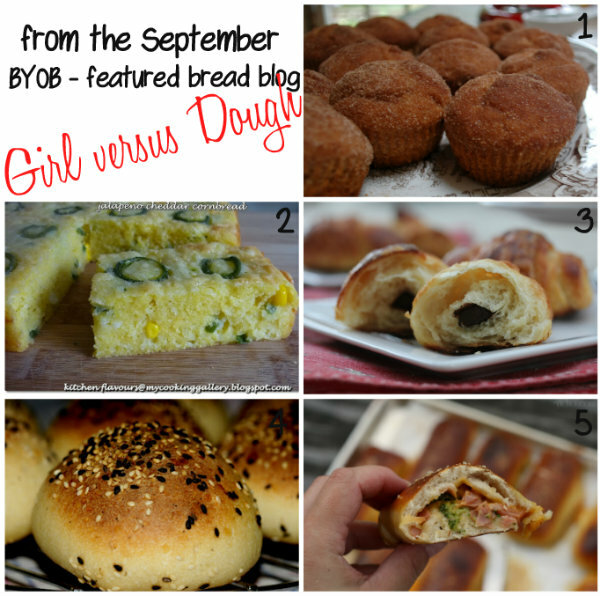 Please scroll down below the linky to find out who our featured bread blog for this month is. And now, I look forward to everybody joining us and helping us to fill up our October bread basket. 1.) Blog about bread. It can be a post about baking bread in any form (yeast, wild yeast, quick breads, flat breads, sweet, savory, loaves, rolls, breadsticks, tortillas, scones, biscuits, crackers, etc.). It could also be a recipe that uses bread in it or as a base (pizza, bread pudding, sandwiches, etc.). Or it could be an informative post, a tutorial or how-to post (such as how to make sourdough, bread baking essentials, favorite products for baking bread, etc.). It could be a review of a book or cookbook having to do with bread. It could be a photo-only post (bread festival, bakery tour, etc.). Anything that inspires us to bake bread at home. 2.) Include a link back to this post or any of the monthly link-up posts (link in my sidebar or at the bottom) OR link to one of the other hosts. As long as there is a link that leads people back to BYOB. You can use a text link or the BYOB button. 3.) Add a link to your post in the current month's BYOB linky/roundup post on any of the hosting blogs. If you are participating in the optional BYOB - Featured Bread Blog, please let us know by dropping me a note in the comments or somehow marking your post. 4.) Please link only posts from the current month. Let the filling of the October bread basket commence! 11. Rose Hip Levain - Made from Jam! 34. Oatmeal Walnut Poppy Seed Bread and Awesome Egg Salad! Looking for a little inspiration? Well, not only can you click on any of the wonderful links added to the BYOB bread basket each month, you can also join us in our optional feature, BYOB - Featured Bread Blog! Each month we will feature one blog. This blog doesn't have to be all about bread, but it will contain enough bread recipes to offer diversity and inspiration for those at different stages in their home bread baking journeys! So, it you'd like to bake along, our featured blog for October will be Farine. If you decide to join in and bake something inspired or adapted from this site, please be sure to take your own photos and re-write the recipe in your own words, as well as linking back to the original post with a credit. If you think of it, leave a comment while you're there...let them know they inspired you. Don't forget to leave a comment letting me know that you participated this month (or in some way mark your entry), so that I can add you to the round-up for next month! As always, feel free to tweet any BYOB posts using the hashtag #BakeYourOwnBread. I will be tweeting entries using that hashtag. I've also started a BYOB Pinterest Board to share the love! Always feel free to leave a link to your Pinterest page and/or your Twitter handle in the comment section of any monthly link-up. Also, if you have a suggestion for an upcoming featured bread blog, let me know! I added BYOB to my spread sheet so I remember to add my link! Looking forward to this Heather! I have no idea where October came from, but boy do these look good! Wonderful idea Heather! I've been experimenting in a woodfire oven lately. Would love to participate in this link up. Hi Heather, I accidentally made a duplicate submission (Walnut Maple Yeasted Cake), can you remove one of them? Thank you! Yes, of course, no problem. I've been dealing with being sick lately (still am), so I'm pretty behind. I will get it done, though. :) Thanks for linking up! Sorry Heather about screwing up the first time on trying to link up! Big oops! no biggie, I'll delete the first one. That bread look gorgeous!